I was at Esplanade yesterday and was looking for a place to eat. Saw Harry's on the directory and went straight to it, thinking I'd get good steak. I was a little confused between Harry's @ Esplanade and Harry's Steakhouse, but when you see the place you'll know that the former is a pub or something. So our group of 4 sat at a really small table where the plates were too big for it. We ordered a Fillet Steak, Rib-eye Steak, Fish & Chips and Chicken Burger. I must say everything but the Fish & Chips was disappointing. Appearance wise, the F&C wasn't fascinating. I think hawker centres can do better, but nonetheless, in comparison to the others we had, the F&C was the best. The breaded fish was crispy and the meat was very soft. I'd say both steaks were bad. 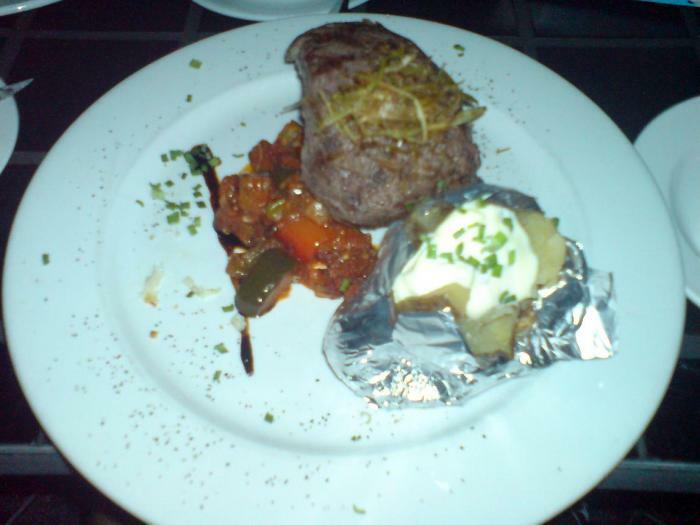 I had the Fillet Steak with pepper sauce and a jacket potato and corn cob as side dish. The corn cob was bad because when you bite into the corn, it tastes very mashed up like the corn isn't fresh. I've never had anything like that before. It was horrible I couldn't bring myself to eat it. The potato itself was all right. At least the potato was soft. But they left out the bacon bits (which I later found out wasn't crispy. It was actually bacon slices cut into small pieces) on my potato and there was very little spring onions and sour cream. The steak had no taste of the pepper sauce at all, which goes the same for the Rib-Eye that my mom ordered - had no taste of the sauce requested. As for the chicken burger, it was big no doubt. Looked good. But I guess all that would have been good on the burger would be the bread, tomatos, lettuce and nothing else. Realize what's missing? Yes, the chicken. The chicken was dry and tough, it could have been mistaken for yesterday's. Lastly, they have nice waiter and waitress who tried to attend to all our needs. But I think that was all they had - 2 of them. I must say it did look like they were severly under-staff. They can still function well with 2 of them, but I'm complaining only because they can't. They miss out orders here and there. I hope that's only because it was a public holiday yesterday and they couldn't get people to work. No matter what it was, I think that was my first and last time there.. I'd give a 1.5/5, but since there's no 1.5, I'll give it a 2 then. That sounded like a horrid experience. Nothing was good even. OMG! Don't you hate it when you don't get the service you deserve and yet have to pay for the 10% service charge! talk about service charge, GST is effectively 17% now at many places. Can you imagine paying almost $10 extra on your bill just because of the GST?! rahh..! then again, the people serving us were fine. they were just understaffed.